On Meet The Press, Ann Romney Said That She Can Empathize With People. But Can Mitt? Before the barrage of ad homs begins, ask yourself this question: why did the Romneys let themselves get sucked into this kind of talk on Meet the Press (with David Brooks) on Sunday in the first place? Why is she saying that they (the Romneys) know what it is like to struggle, and then proffer her own personal health struggles as evidence that they know what it is like to struggle? .... because the inevitable question surfaces and arises: voters will feel empathy towards Ann Romney, but they will ask how Mitt Romney has struggled (financially or whatever) and how he can therefore empathize with people. And they will say that Mitt is on the ticket, not her. And finally... it seems to echo John Edwards from 2007-8. Why did they let themselves get sucked into this “we feel your pain” stuff? No one twisted their arms and forced them to get sucked into this kind of talk. bull..I want someone who will stop the wasteful spending , promote jobs and secure the country. Not interested in any politician’s empathy or sympathy. Just want him to do the right thing. Considering the disaster in office right now, this is NOT an issue that voters should be worried about. This is one of the really really stupid things American voters worry about. A President of 330 million people doesn’t have the time or energy to spend worrying about you. Yet about 15% of the voters will decide their vote on THIS stupid feelings issue. Then why are the Romneys, especially Ann, talking about this “we feel your pain” stuff and can empathize with you? People will inevitably ask how Mitt can personally empathize with others, since he is running for Prez, not her. Why are they talking about this stuff? It reminds one of John Edwards in 2007-2008. Then why are the Romneys letting themsleves get sucked into this “we can empathize with you...we have also struggled” stuff? "Not interested in any politicians empathy or sympathy. Just want him to do the right thing." That's right. The President needs to limit himself to Article 2 of the US Constitution and feeling sympathy is not part of it. I don't want a President that "Empathizes" with people, I want a President that protects liberty. Then why are the Romneys letting themselves get sucked into this kind of talk? Why are you creating a phony strawman? Let's go to the transcript. and to talk about your husband. And to talk about how he's connected to people in your lives and in-- in your family. There was something that caught my attention, I'm sure it caught yours from the keynote speaker of the Democratic convention, which is-- sort of went to this charge that somehow neither one of you are as empathetic about what's going on in the country to people who are out of work. And the line was from-- from Julian Castro, the mayor of San Antonio, You just don't know how good you've had it. How did that sit with you? MS. ROMNEY: Well, I think the-- the thing that I want to communicate to people, and that it's so important that people understand, is that Mitt and I do recognize that we have not had a financial struggle in our lives. But I want people to believe in their hearts that we know what it is like to struggle. And our struggles have not been financial, but they've been with health and with difficulties in-- in different things in life. And one thing that I-- that I again like to remind people is that multiple sclerosis has been my teacher. It has been at times a cruel teacher. But it has also been a great gift in my life because what it has done it has taught me to be more compassionate and caring for others that are suffering. And I know that people are suffering right now. And for people to think that we don't have empathy just because we're not suffering like they're suffering is-- is ridiculous. Its-- its ridiculous to think that you cant have empathy for somebody thats struggling. Our life has always been devoted to those that are struggling more than we are and I was grateful for the opportunity that we had at the convention for others to speak up and talk about the kind of lives weve led-- weve led. And in particular for Mitt who really has been demonized in many ways as being heartless. And for people to stand up and say, excuse me, he was there when my son was dying of leukemia. He came to my sons bedside. He did all of these things for my son. And then another woman saying how Mitt was there for her. So therere hundreds of those stories that havent been told. And it was refreshing to me for the American people to finally be able to see the lens through which I see my husband and the perspective in which I understand how he operates. GREGORY: As a candidate now when was the last time you really got to spend some-- some quality time with somebody who is out of work and what did you get from them? MR. ROMNEY: Well, actually, just last night it was I was with a person who is facing some challenge. We spent some time together and shared our personal experiences in an effort on my part to point out that we can make it through tough times. Look, thats part of everyday life for mo-- most people. You have friends and you have acquaintances that have challenges and you talk about them. And-- and I can tell you this, my-- my life has been greatly enriched by my relationship with this young lady here and I know how well Ive got it because I was able to marry Ann. But the reason Im in this race is to help people. Im not in this race to slow the rise of the oceans or to heal the planet. Im in this race to help the American people. And this is a commitment on my part, on Anns part, on our familys part, because we care very deeply about this country. And-- and I-- I really think that-- that those people that try and minimize the-- the feeling and the connection we have with the American people really miss the mark very badly and are trying to divide Americans based on who has money and who was able to achieve success and who does not have as much. And frankly Americans are not defined by whether they were successful financially or not. Were a nation that has come together and a United America can solve that kind of challenges we have today. They were responding to a direct question from Gregory. What should their response have been? I provided the transcript in an earlier post. IMO they handled the question well. Why are you making up the bvogus charge that I am offering up a strawamn? I offered up NO strawman. Ann Romney said that MS has been her teacher. You quoted it. Period. So that backs up what I said: She did proffer her personal struggles that she has faced as evidence that she can empathize with people. And it then leads to Mitt: Can he personally empathize with people? Why did they let themselves get into this? Examples, William Henry Harrison, the hero of the Battle of Tippicanoe, ran for President using a "log cabin" emblem, although he was actually born in the Harrison's beautiful Virginia Tidewater Manor House. Lincoln, who actually had been born in a log cabin, copied Harrison's technique. FDR, who basically promoted a domestic policy very similar to that of the National Socialists in Germany, in the same era, used his little dog "Falla," to project a vastly kinder, more humane image than that of his German equivalent. To similar effect were his cozy "fireside talks." Jimmy Carter's carrying his own suitcase in 1976, was his device for the same purpose. The Romney Convention set the tone for emphasizing the personal compassion that Gov. Romney has shown to neighbors & other close acquaintance, through the years. It is perfectly legitimate & can only help. Remember that most Americans are not really ideological--except in a negative sense of knowing things that they do not like. Read the transcript again real slow so your lips don't get tired. They were responding to a question. What should they have said? Romney gives at least 10% of his earnings to the church and charities. He is a throwback to the days when men of character did not brag about their acts of charity, but did it quietly and anonomously in some cases. As Ann Romney said, this is ridiculous that they can't have empathy because they are financially secure. Again, the Romneys did not bring this up. It was an attempt at a gotcha question by Gregory. Later in the interview Gregory again tried another gotcha question on Obamacare. What should the Romneys have said in response to Gregory's question? Then why are the Romneys letting themsleves get sucked into this we can empathize with you...we have also struggled stuff? Looking at Romney’s past record, you must remember that Mitt was ahead of Teddyboy Kennedy with a short time to the election and he mysteriously ‘morphed’ himself into Teddy and lost. I don’t know if I am being hyper about this BUT IMNSHO he tanked the election for Senate and ended up as Guv as his ‘reward’. Every time I see one of these little ‘miscues’ I kind of wince, especially since ‘they’ shoved him down our throats. Where is the Romney that slashed his way through his R challengers, leaving no bodies in a very scorched earth policy? Next thing you know, Mitt will be saying BO ‘ain’t such a bad guy’, and him Boehner, McConnell and BO will be playing a round or two and we will experience BOHICA - again. If you have to tell people you are empathetic, you’re not. How do you respond to the question about the "charge that somehow neither one of you are as empathetic about what's going on in the country to people who are out of work.?" Romney gives at least 10% of his earnings to the church and charities. He is a throwback to the days when men of character did not brag about their acts of charity, but did it quietly and anonomously in some cases. Actually Bishop Romney is a powerful figure in an anti-Christian cult, and he is required to give at least 10% of his money to the cult, or he cannot become a God. Mitt Romney has zero character and he doesn't give anonymously, he is required to, and he is interviewed by the cult leaders every 2 years, verifying that he is meeting that requirement, his ID card must be renewed every 12 months, proving that he has made that mandatory "charity" giving, ID cards are issued so that you can prove that you are complying to the cults demands. An Aluminum Foil Deflector Beanie (AFDB) is a type of headwear that can shield your brain from most electromagnetic psychotronic mind control carriers. AFDBs are inexpensive (even free if you don't mind scrounging for thrown-out aluminium foil) and can be constructed by anyone with at least the dexterity of a chimp (maybe bonobo). 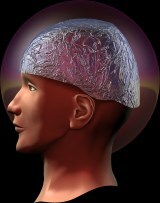 This cheap and unobtrusive form of mind control protection offers real security to the masses. Not only do they protect against incoming signals, but they also block most forms of brain scanning and mind reading, keeping the secrets in your head truly secret. AFDBs are safe and operate automatically. All you do is make it and wear it and you're good to go! Plus, AFDBs are stylish and comfortable. What are you waiting for? Make one today!